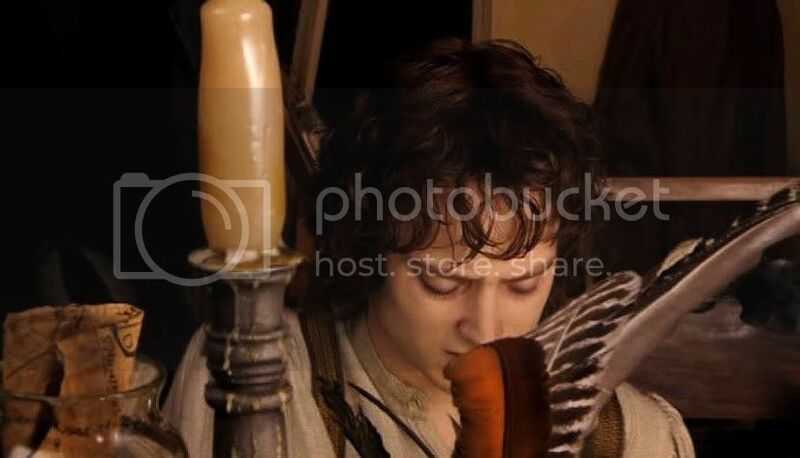 The film scene of Frodo writing at his desk writing in Bag End not only reminded me of Pearl’s story, but also a poem by jan-u-wine, The Tale of the Tale. 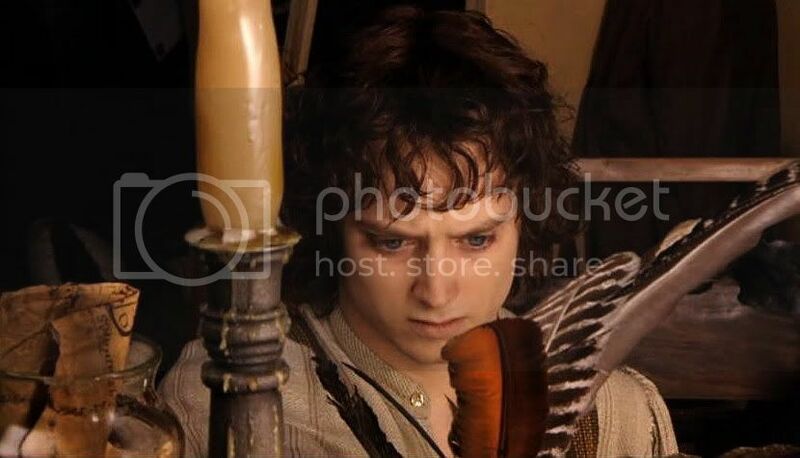 It focusses more on Frodo beginning to write his story, not the part when he is in the midst of it. 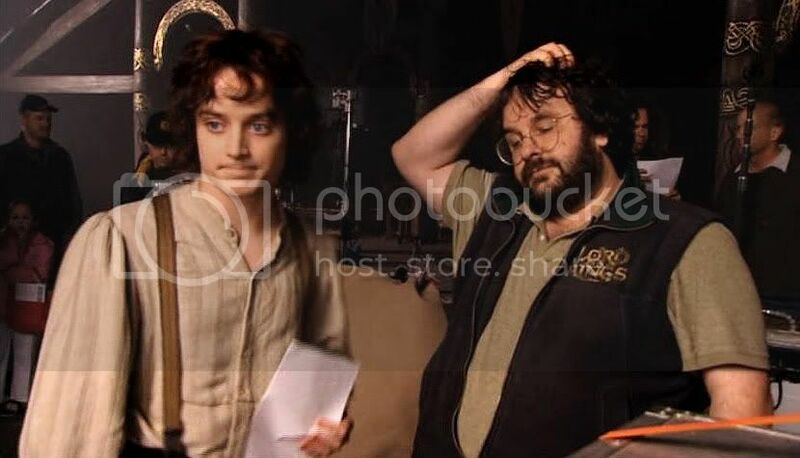 In order to have another series of images to go with this poem, I took a look at the RotK Extras from the EE, remembering that there was a very moving sequence in Cameras in Middle-earth, which recorded Elijah Wood filming his last takes as Frodo: the desk scene. This scene was the last filmed on of the last day of filming for the entire trilogy. 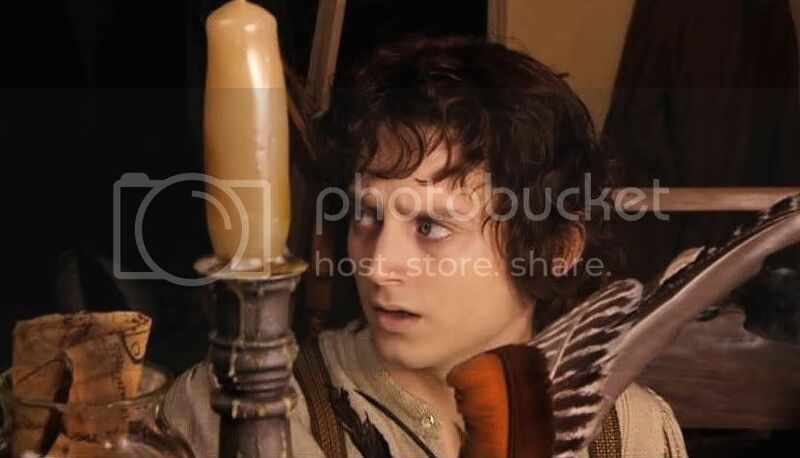 Dominic Monaghan recalled thinking, “Come on Pete, you’ve got it,” referring to the repeated takes Peter Jackson made of this scene. PJ himself said that it was hard for him to finally say, “O.K. Check the gate.” He knew he would be saying it for the last time. This wasn’t the end of principle photography, this was the end of the pick-ups that continued long after principle photography had finished. Whatever take it was, it produced beautiful caps, slightly different in inflection and taken from a different angle. I feel as though this second set of caps allows me to turn the gem of his performance; different facets, different beauties. Also of note, because this take was not used for the film, none of it has been digitally graded. The colours in the frames are what would have appeared in the camera lens according to the lighting actually on set. These screencaps have only tweaked for focus and contrast. Although the first five caps are not part of the played scene, I have included them because of the way they show the actor at work. 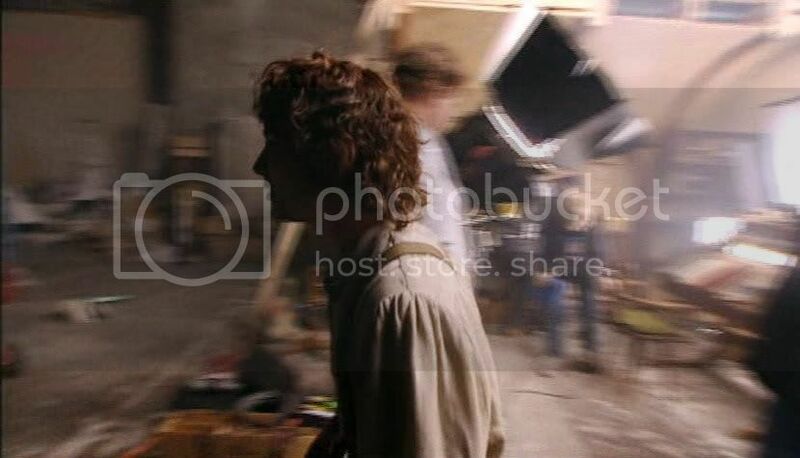 He shambles across the sound stage as himself, then begins to change gears as he listens to Peter’s direction. I am sorry there is no clear footage of the moments just before Pete says "action". I would like to have seen that moment, especially on this occasion. 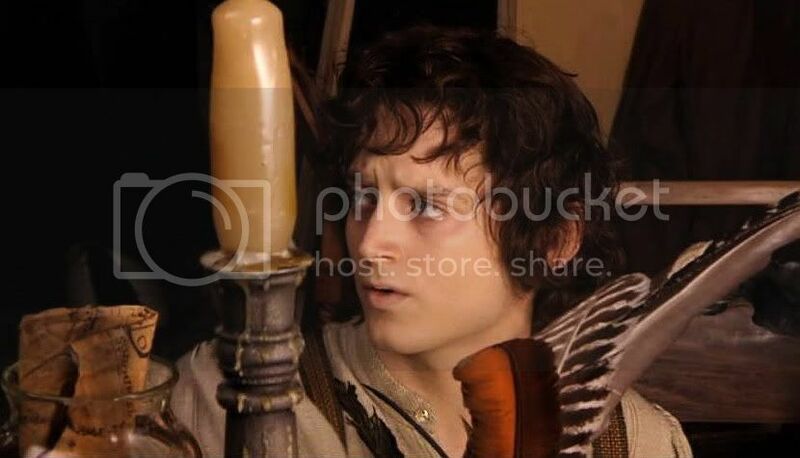 To act this scene -- aware that this would be his last scene as Frodo after three intense, sometimes gruelling but also wonderful years -- had to have produced an indescribable mix of feelings in Elijah Wood. I think these feelings were put to use in the performance. 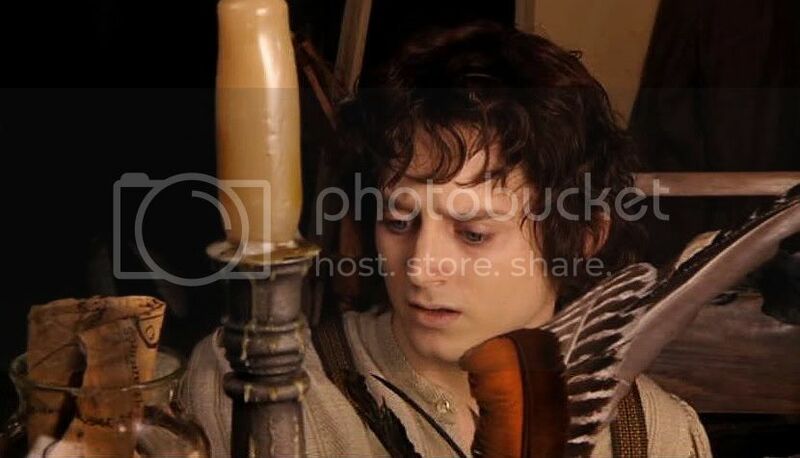 A beautifully played and shot scene, I only wished they had let us see more of Frodo in this sequence than they did. Happily, scrolling slowly through these caps gives me the feeling they did. The Tale of the Tale follows the screencaps, which I hope will set it off, for quite a tale it is. who and what I became. and running with Mari's jam. down the hall-way and into the study. I wait for the sound of shears. The fresh whiteness of the page smiles at me. I take up the pen and begin to tell our tale. Well! That got poem got the waterworks going. I've always suspected that Frodo and Sam never really talked about the Quest after it was over, that they just watched each other, knowing what each was going through; Sam could always work out what his master was thinking. 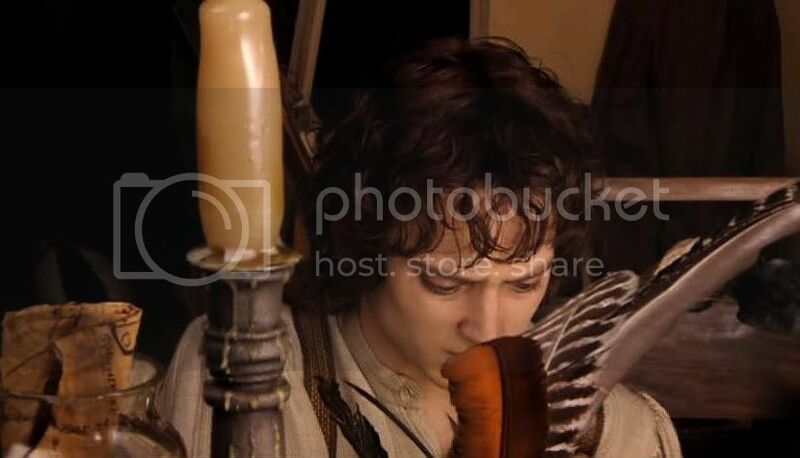 But I like the idea of Frodo talking with Sam, getting Sam's input, and then being able to write with Sam's memories to soften his own. I like that idea alot! It's a beautiful look at their post-Quest way of being together, isn't it? I suppose they were often past the need to speak, having shared so much, just an exchanged look. 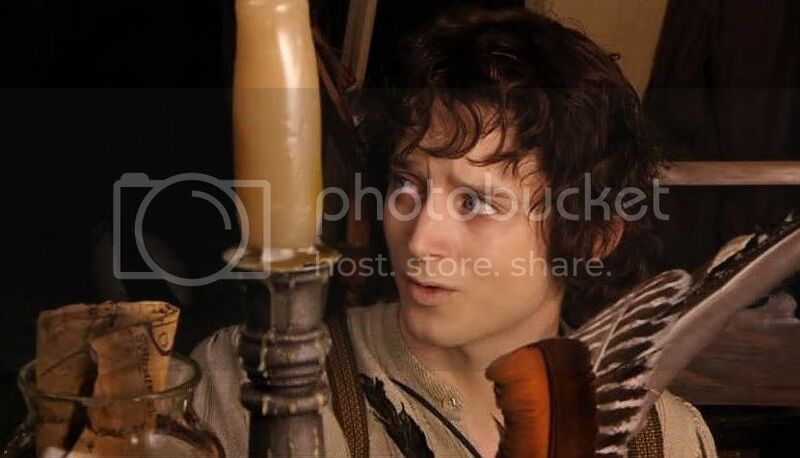 But as to the "stuff" of what happened on the Quest, how appropriate -- and plausible -- that Frodo would have asked Sam for help recalling, especially for the times when Frodo himself was not...himself. Boo hoo hoo! So beautiful. Couple of times this week I've caught the middle of a radio story about a Viet Nam vet, and what he went through after he came back in terms of PTSD, and bad memories. He said that when he first came back his friends would has "what was it like?" and he'd tell them things. Too many things, details they didn't want to hear and that he himself had a hard time living with. Soon his "friends" didn't come around anymore. He felt different than everyone else, and became quite isolated for more than two decades. Happily, he eventually found his way out - partly through making contact with other vets on the net. That must have been the kind of thing that Tolkien was writing about when he has Frodo say coming home is like "falling asleep again." 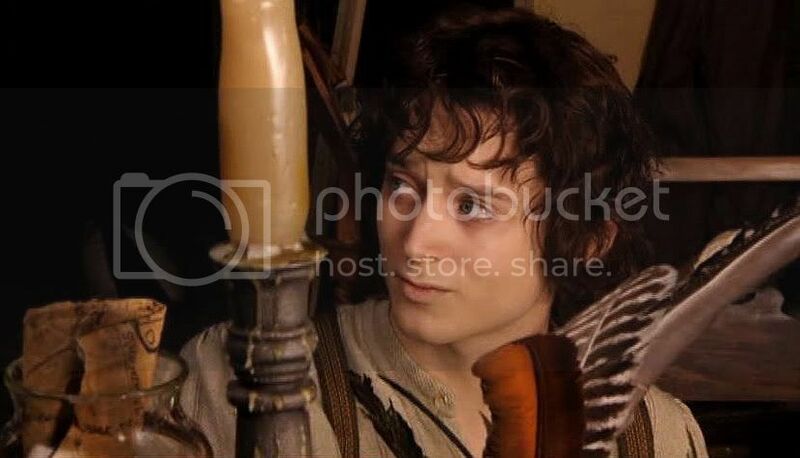 And listening to this gentleman's story on the radio has got me thinking about that brief discussion we had a few weeks ago about the other three hobbits, and how they coped back at home. 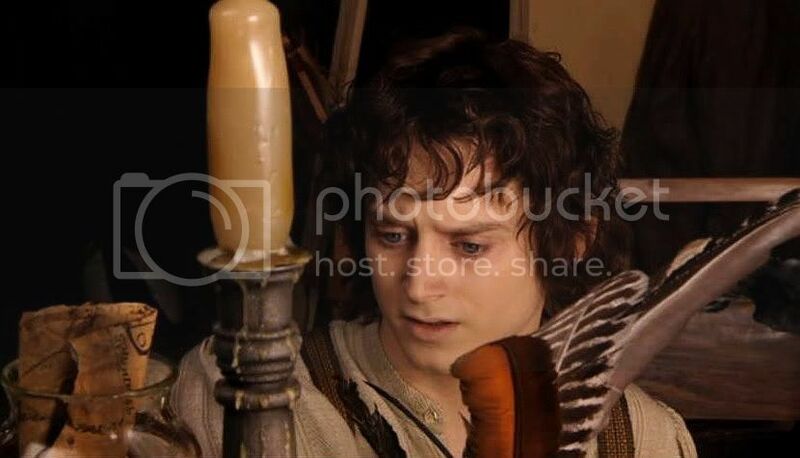 For me it brings new perspective to Merry and Pippin sharing Crickhollow for so many years; it must be comforting - when the shadow falls on you - to know that there is only empathy for your momentary confusion and panic. Poor sweet Frodo, he's so pale and suffering in this scene! Look at those dark circles under his eyes. It always break my heart seeing him like this! Thanks again for sharing those wonderful caps, dearest! Yes, the circles do look darker. The look of his face is more stark. I think in post-production they not only changed the palette for this scene to something more leeched of colour, they softened it, giving that "old illustration" look; autumnal, yellowed, almost dreamy. I feel as though this second set of caps allow me to turn the gem of his performance; different facets, different beauties. What a lovely way of expressing this, Mechtild. And what a lovely poem. Yes; two gems. :) Thank you, Shirebound. 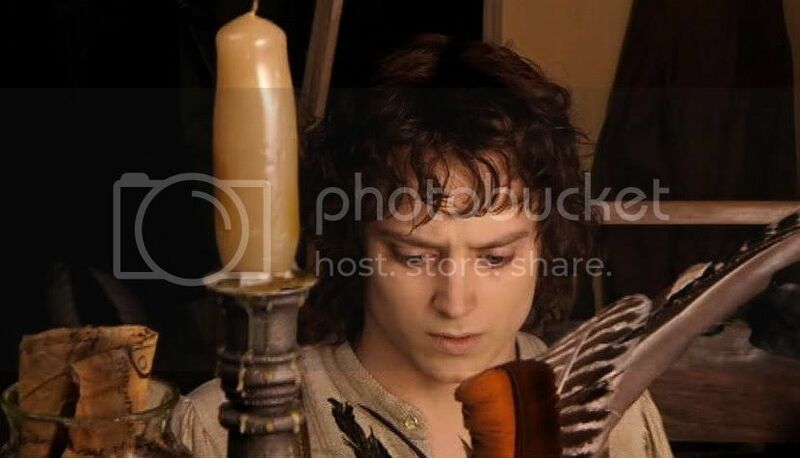 But Frodo is not sad in this poem. He has just begun to write, and he's feeling rather positive. 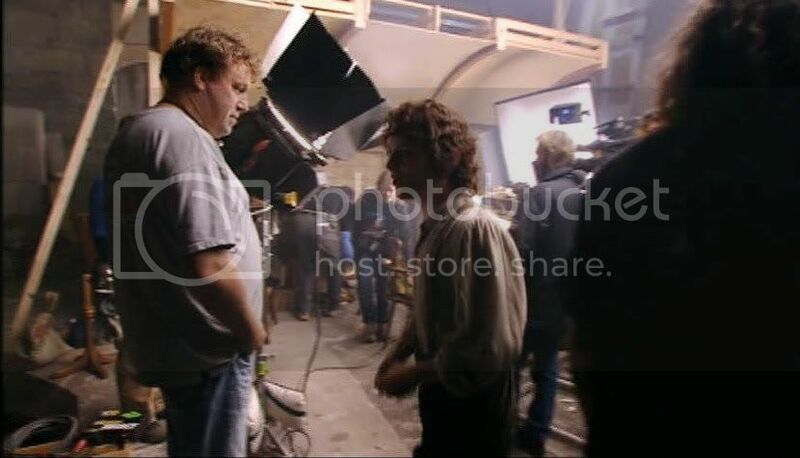 But, it makes me weep anyway, since I know the project will end in his departure, "too badly hurt", with the Shire "saved, but not for me." Perhaps that's what you mean, White Gull. There are more Jan poems coming up, to illuminate all but one of the end scene screencaps posts. They are all weepy, too. But, I love them to pieces and thought they went together well with the images, each bringing the other out. Good luck and great pleasure writing your new fic! 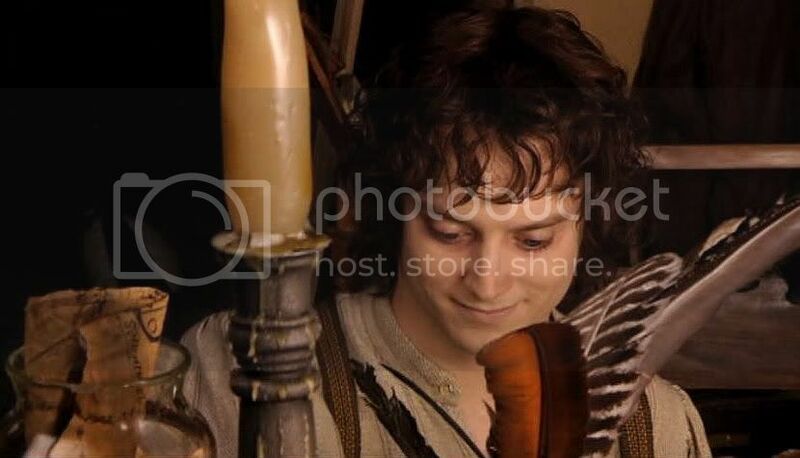 Watching, in these screencaps, sweet bouncy yet thoughful Lij metamorphise once more into that sober, sweet angel Frodo Baggins. But what a lovely, healing scenario Jan comes up with. I LOVE that Frodo would seek Sam out, and they would talk softly together, unburdening, in the Bag End garden. Oh, Pearl, you enrich my appreciation so much. I thought I couldn't love the screencap scene or this poem more, but you have shown me new things to hold close. This really is the best sort of thing fandom can do: enhance our love and understanding for the text; increase our gratitude for the sheer gift of Tolkien's passion for the story and loving toil creating it, all through this sort of mutual exchange. 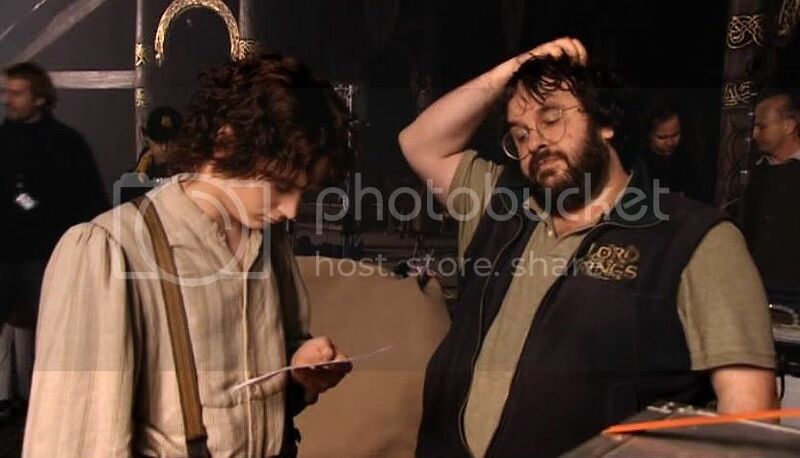 Whenever I think of Elijah as Frodo, it breaks my heart how young he was when he made this journey of sorts that was the making of Lord of the Rings. It was an awful lot on his shoulders, and a tremendous responsibility to do that role well, but I think he rose to occasion. He probably grew more as an actor -- and as a person -- than anyone his age ever has performing a role in a film. Which is the only thing that makes me sad about the whole thing: that what will probably be his mountain top experience should have happened at such a young age. Were you able to see the screencap entries that preceded this one? I've been making a huge push to finish all my screencap posts that have been piling up all at once. They had some gems, too. Yes, it must be deadening to carry all that around, good and bad, and no one really wants to hear it. I suppose people find it hard to bear, even vicariously, and feel guilty as they listen that they didn't have to go through such hardships. Both feelings would tend to make heares recede, leaving the veteran feeling more isolated and as if they had been wrong to try and tell any of what had happened. 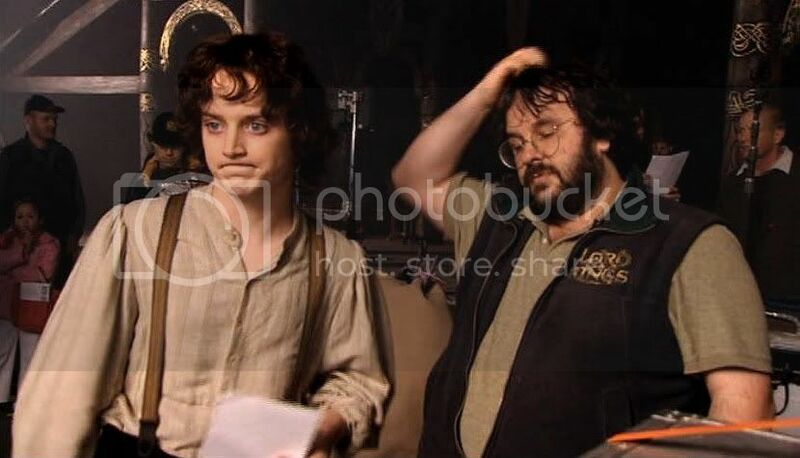 You can see in that scene that he's feeling a lot of different emotions as he gets ready to finish the work that had taken so long and during which he grew and changed so much. Yes, very much so. It was life-altering, even for someone at his age, on the cusp of full adulthood. It was a great comment. I am sure I shall never forget it. That's what's so cool about the online fandom, there are so many acute minds and empathic sensibilities. How can one not be enriched? Came over via mews and have enjoyed all three of your contributions. I love the way you've taken jan-u-wine's poetry and so artfully engaged it with your screencaps that it tells its own story. But as I read more and more of Jan's poems, I kept having "Wow!" moments, thinking how well the poems and the caps would suit each other. 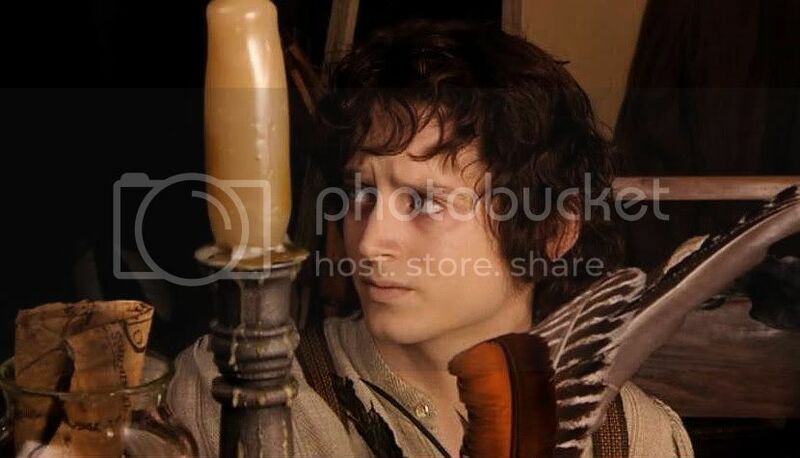 I had posted some of Jan-u-wine's poetry before, when she wrote a few inspired by some of my Frodo art manips, but I never thought of pairing her poems with screencaps. It's been a fun challenge to design and prepare this long series. I still have seven or so more in the hopper, almost ready to post. Only the next three have no poem to go with them. Tolkien's text and the caps will stand on their own. Fabulous. Something to look foward to! I’m so deeply moved, you left my weeping. I want to say so much but I’m too moved to write. The way Elijah transforms into Frodo is incredible. The gentleness, the expression on his face … he was simply perfect for this part. Your quote, the caps and the wonderful poem of jan_u_wine… I don’t know what to say but THANK YOU! I’m crying everytime I’m watching this scene, it’s very touching, though it hurts it’s yet full of hope. And so is Jan’s poem. Heartbreaking and so beautiful. The best of the quote, the pictures, the poem is not the thought which they contains,but the thought which they suggest. Frodo talking to Sam in Bag End’s garden… I love that imagination to pieces. What a wonderful silent conversation. Thank you mechtild, thank you jan_u_wine. You are welcome, Julchen. Thanks again so much for posting at length. Your generosity of spirit - and of effort (it can't be convenient to write in a second language, even if you are so good at it) - moves me. The screen-caps are lovely Mechtild. Thank you. I have seen and enjoyed the documentary too. I must put aside some time to watch it again. P.S. What became of the Harem? I haven't had a notice in the box for over a week. Maybe it has truly died its final death. The first 5 scenes he looks so sad, yet determined. It makes me tear up, the remembrance of sitting through the last movie and knowing it was over. I was depressed for weeks afterwards, especially since they had left out the possibility of Sam traveling into the West at some future moment. 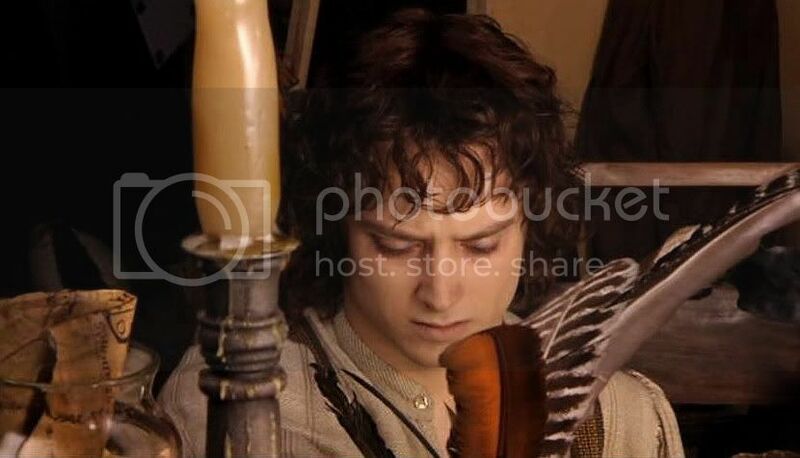 These pics bring all of my own memories to the fore and I can't stop looking at the talented actor's lovely, perfect face as he plays his part in what will be, for all of us, a continueing tale. The prose is so lovely, so telling, of his love for Sam and all that was. I really loved the way she wrote it. 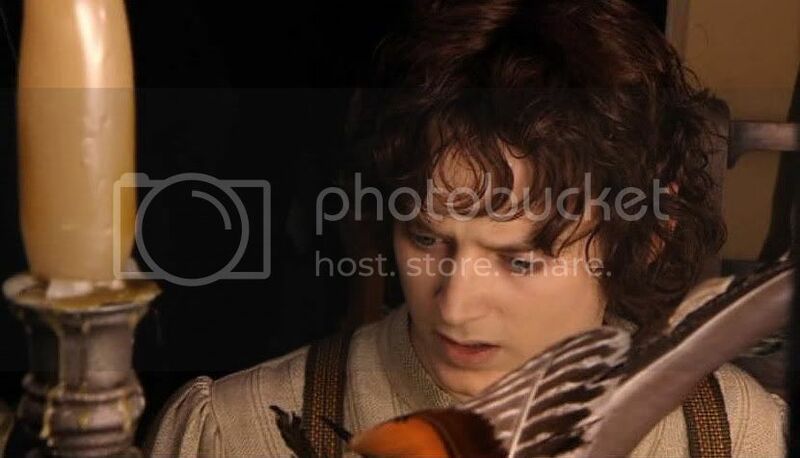 Thanks, Lovethosehobbits. 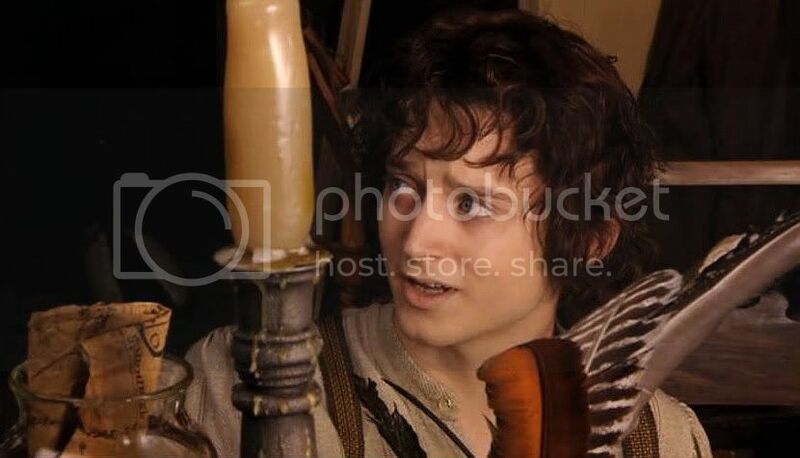 It really was a wrench to know there would be no more LotR after RotK. I think that increased my sob-factor, too, all during that time. But the film didn't depress me; I was bursting with love for it and a desire to talk about it non-stop - and cry a lot.